Qtrade is an independent discount brokerage which has done extremely well in the annual Globe and Mail brokerage rankings. After calling them a number of times, I can see one of the reasons. They are super quick to answer the phone. Qtrade has competitive fees for investors with at least $50,000 to invest or trade at least 30 times per month. For smaller, less-active investors, the fees are better than the big banks, but not as good as the smaller discount brokerages such at Questrade. Their customer service is one of, if not the best in the business. 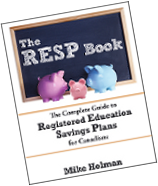 They offer US$ RRSP accounts and is one of only two discount brokerages (Questrade being the other one) to offer RESP additional grants, Canada Learning Bond, and ACES grants (but not QESI grants). $19.00 – If household assets are less than $50,000 and less than 30 trades executed per quarter. $9.99 – If household assets are greater than $50,000 or 30-149 trades per quarter. $7.00 – If 150 trades completed or more per quarter. Canadian Registered accounts – Qtrade charges $50 per year on registered accounts (ie RRSP, RRIF etc) that have a balance less than $15,000. US$ RRSP – $50 regardless of account size. TFSA – No annual fees. Non-registered account – No annual fees. These fees are comparable with other brokerages and in fact the ~1% cost for trades greater than $25,000 is pretty good relative to other brokers. Full range of mutual funds available. $1,000 for registered account. $2,000 for margin (non-registered) account. This applies to select ETFs where the purchase amount is greater than $1,000. I find the interface very user friendly and easy to navigate. When I compare to TD, QTrade wins hands down. The layout is easy to navigate and use in all areas. The only bad thing I would say is on occasion it seems a little slow, usually in the off hours. Customer service has been very impressive. Phone calls are typically answered in a couple rings, and most of the service reps I’ve spoken to are extremely knowleadgable. They also have a secure email system that is always answered first thing the next day that is very handy. I also find they are willing to give online trading commission when calling in and needing help due to technical issues. EG I had an ETF going through a consolidation and wanted to sell, so they did over the phone for no extra cost. Research tools are adequate for my needs, although I will say TD has more. That being said I find I’m always using the charting and technical analysis tools at Qtrade as they are much easier to use. If your looking for analyst reports then QTrade doesn’t have a great depth on that, but I haven’t found anything else lacking. This might be a good thing knowing how well analysts can predict stock movement anyway lol. I’d consider myself a mostly passive investor, but cannot help being a little active. I sell the odd covered call, and have done a couple trades. I also try to be tactical and smart when putting new money to work. The commission free ETF’s switched to a minimum of $1,000 purchase at some point last year. Would have been nice if it stayed at no min, but I understand why they needed to to that. From a risk management point of view I have 2 thoughts that I probably should clarify with them at some point. 1. Being in Vancouver, I really hope they have a good data backup system in another part of the country in case the big earthquake hits. 2. When calling in I’ve found they don’t ask as many questions as TD to verify the caller is who they say they are, I wonder if they are open to fraudulent action due to this. The secure Email this is not a concern. ECN fees are also annoying. Good incentive to keep trading to a minimum I guess. I switched financial institutions last December and moved from Credential to Qtrade. I don’t trade a lot and find them fine with the only surprise I had was the “per share” cost added to the 9.95 trading fee. One feature I would like to see is a consolidated share report which show the total shares held for my various accounts. My wife and I have several different accounts with, say shares of BCE in several of them. For asset allocation purposes it would be nice to know at a glance my total investment in BCE. I don’t bother with the other features as I am a dividend investor and don’t trade that much. Trading platform/interface – I like it. Easy to use, no delay. I’ve got an account with Interactive Brokers as well, and I prefer the Q-Trade display in almost every way. Customer service – Had contact with them 10+ times over the years, top notch. Research reports and tools – Pretty weak. The reports are mostly Morningstar; I don’t rely on them much. My big pet peeve is with their stock screening tool. In theory, you can select from a lot of options. In reality, it must pull from some sort of old data as often the screener results do not reflect the desired search well. What type of investor are you? I’m a mix. Most of my assets are passive, but I day trade a small part of my portfolio. 1) Trading platform/interface – are these ok/good/bad? Personally, I love it, to me it seems logically presented and without tons of crap on the screen (other than the opening screen), but if you want detail you can drill down and get whatever you want. 2) Customer service – any impressions you might have. Crazy amazing. You call and get them right away (and this is on the non-vip line… even though I qualify for the vip line, I never bother looking up the number because the non-vip line guys are great.) I’ve never stumped them on anything and they’ve all solved my problems so fast it’s great. They’re also quite empowered… there were a few times when funds transfers were going slow and I would miss an opportunity. I have no margin or lending facilities on the account, but they saw it was on the way and the person answering the phone authorized the advance on funds. No phone monkeys or layered levels of customer service here! 3) Research reports and tools. Do you use these and are they any good? They mostly have the Morningstar reports, and I’m ambivalent about them because I feel Morningstar does a terrible job at keeping them up to date promptly… once a month updates on their recommendations, and on specific companies it could be months old. That said their technical tools are pretty good, although I don’t use them a lot, mostly as a way to search new areas I want to invest in to come up with names to research. Well, mix and match, I also invest for work’s treasury using Qtrade, and we have different parameters, so I tend to do more short term purchases and flips… not quite daytrading, but definitely active trading, so there’s a few volatile companies we’ve moved in and out of, but the bulk of the investments are for our family… and there I’m mostly buy and hold, I’ve got the odd “gamble” stock but that’s < 2% of my portfolio. And I tend to basically just buy the stocks that the ETFs hold rather than buying ETF’s, no point paying the MER. I don’t get into anything fancy like options, margins, or the like, so can’t really comment there. 5) Anything else you want to add. I can’t really think of anything, I don’t have experience with a lot of other brokers so can’t really compare, but there’s never been anything that would make me want to switch, and even though it’s about a decade away, I’m not looking forward to when I start bumping up on the million dollar insurance limit and need to find a secondary broker. I read this year the Globe picked Virtual Brokers as #1, Qtrade sliding to a close second, so I might check that out, but really, for the service I’m getting I’m quite happy with the VIP prices at Qtrade. (Oh, VIP prices apply when you do a lot of trading… I think 200 transactions? Or when you have over $50k in household assets (all the accounts at a single address)… and it gives you cheaper trades than non-vip.). Personally, I don’t mind paying a bit more for the kind of service I get with Qtrade. I’m also a Qtrade customer and I can say they really are better than any of the big banks. I was originally with RBC Action Direct, but when they kept insisting their $30 transaction fees were worth it I switch to E*Trade. That lasted about one-year until I got too frustrated with their platform, their parent company in the States was on the verge of bankruptcy, and of course Qtrade made their mark in the Globe & Mail rankings. The only thing I don’t have with Qtrade is the RESP because they don’t offer the QESI grants. I would recommend Qtrade to anyone without hesitation. Agree with Qtrade has good customer service and they are knowledgeable. When you talk to them, they would give you clear answer (yes/no), not like when I did an inquiry with other brokerage, where they cannot give a definite yes or no and just give me an answer which is copied from the website. What kind of free real-time quotes does Qtrade provide? Are they the type where you have to refresh to get the latest price, or do they offer free live data? So they get high marks for answering the phone quickly? I guess every company needs a unique selling proposition. I’ve called TD Waterhouse once in five years. I asked them to waive the account fee on my RESP and they did it right away, with no hassle. CIBC’s Investor Edge offers similar commissions for active traders, and Questrade is cheaper all around (including a more comprehensive list of commission free ETFs). I just don’t see anything else that compelling about Qtrade, especially for the average investor who doesn’t trade much. Robb, that pretty much sums up my thoughts. As long as the customer service isn’t horrible, I don’t really care much how good it is. However, apparently some people do care which I guess is Qtrade’s selling point. I always found it odd that Qtrade did so well with the Globe & Mail’s ranking, but it seems like customer service is the differentiator for that survey. Unfortunately the list of commission-free ETFs would be completely useless to us, since it doesn’t include a single holding in our portfolio. They obviously aren’t going after passive index investors by offering free trades on the “iShares S&P/TSX Capped Information Technology Index Fund” and “iShares Global Agriculture Index Fund”. Questrade’s much more comprehensive free ETF purchases has a hidden advantage: I can do currency conversions for $5 + 0.20% using DLR, which makes it cheap it enough to do monthly purchases of US ETFs. I feel that Qtrade has great research and good tools. For me it’s important to have calculators and planning tools to help me plan. That’s the important part of investing and saving for retirement. You need to know how much to save.